Home / Thought leadership and the outlook / Investment Forum / Does a rise in market power explain the ills of developed economies? The spectacular rise in market power of relatively few companies that practically monopolise their industries, especially in the US, is well documented. The adverse impact of this on the broader economy is a matter of concern. A slowdown in output and GDP growth. A significant body of research suggests that a number of the ills besetting developed economies in recent years is the result of a rise in market power. 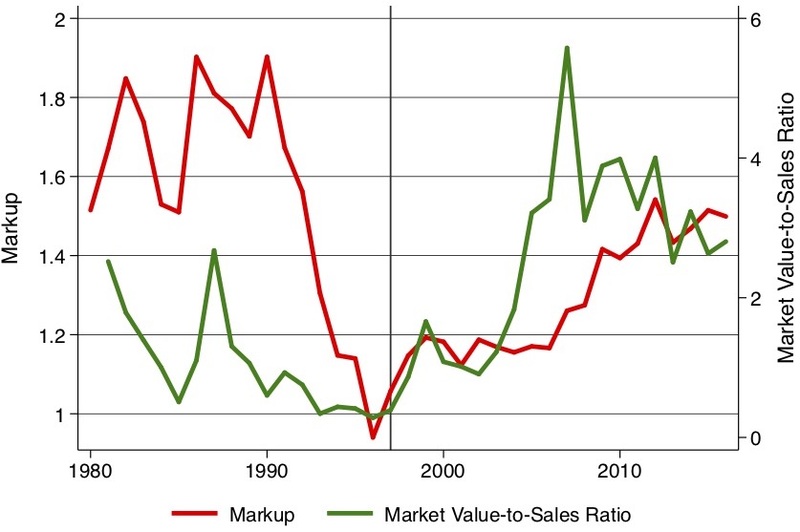 In the US economy, mark-ups (the difference between what a company pays for the inputs it uses and what it charges for the products it produces) rose from 18% in 1980 to 67% in 2014. A working paper published in 2017 by Jan de Loecker of the University of Leuven and Jan Eeckhout of University College London presented evidence that a number of corporations have become powerful enough to see off competitors and charge more for their goods and services. The result is greater corporate concentration in the US economy since the early 1990s, with a limited number of players taking home a larger portion of revenues across industries. This research notes that, at the same time, investment has fallen relative to profitability – capitalism without capital. In an economy dominated by services, intangible capital (e.g. software, management practices) is vital. Intangible assets mean companies can grow very quickly (think of some of the tech companies that in 10 or 20 years have become world giants by market capitalisation). In 1975, 109 companies collected half of the profits produced by publicly traded companies in the US; today, just 30 companies collect half the profits. Greater market power for firms may also mean less bargaining power for workers, and hence lower wages. A study conducted by David Autor of the Massachusetts Institute of Technology and four other economists found that workers’ share of income in America has declined most steeply in the most concentrated sectors. While these superstar companies operate in a competition-free environment, all the others struggle in a world where pricing power is increasingly rare, forcing them to keep prices low to attract customers – so there is greater polarisation in the corporate sphere. An increase in wage inequality as wages for low-skilled jobs fall in contrast to an increase for skilled wages via profit-sharing among managers. What’s behind the rise in market power? Rapid technological change, allowing companies to better create and preserve situations of market power, is the common factor among the candidate explanations for the rise of market power. On this basis, it is not obvious why mark-ups should decrease even though they are already reaching heights many times above those previously seen (based on data since the second world war).